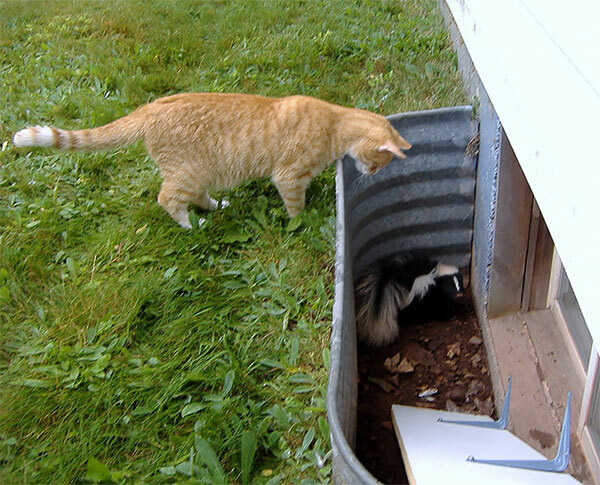 Skunks would almost not be considered a nuisance pest if it were not for the mortifying odor they produce. Skunk removal must be done in a timely manner to avoid the skunks from spraying again. Common complaints about skunks include digging in the yard, house smelling like skunk, or skunks killing livestock such as chickens.  Pest Wildlife Removal companies can offer deodorization of skunk smells in the house. 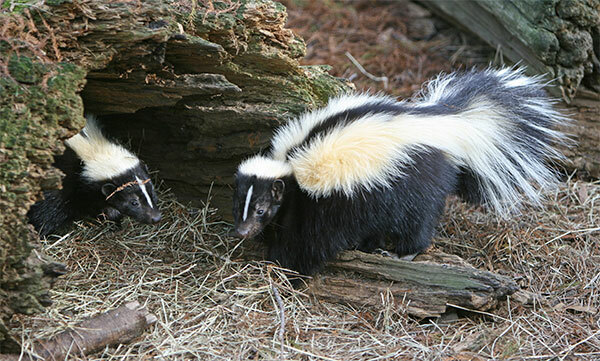 Skunks are famous for their skunk spray—you can smell an angry skunk from over a mile away. Furthermore, a skunk can “shoot” you from 10 to 12 feet, sideways, up, or down, with little apparent effort. Skunks also dig for grubs in lawns when wet soil conditions push grubs close to the surface. When the soil dries, the grubs move deeper, so the problem can generally be stopped or prevented in the first place by not over-watering lawns. Keep your dogs and cats indoors or on a leash outside, because the skunks are out. Skunks are leaving their habitats looking for mates. Don’t approach the skunk yourself. Call one of Pest Wildlife Removal's local animal control officers, wildlife rehabilitator, health department, or police department for assistance.